Sony Alpha dSLR no longer "vertically challenged"
Sony’s first dSLR. the Alpha A100, was a great effort, but it did fall short in a few areas. From the e-mail and comments i get at Alphatracks, the biggest complaint about the A100 is that it didn’t offer a vertical grip option. As I’ve pointed out before, this wasn’t Sony’s oversight. The A100 was based to a large degree on the very successful Konica-Minolta Maxxum 5D. For some unexplained reason, Minolta and friends crippled the 5D by not designing it to use a vertical grip. The 5D’s big sibling, the Maxxum 7D, did offer an optional battery grip, but the 5D was a different design and couldn’t use the 7D grip. 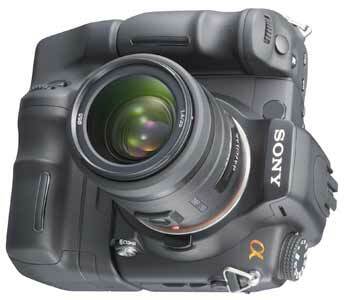 When Sony built the A100 on the chassis of the 5D, there was no provision for a grip. Sony would have had to heavily massage the 5D components to add grip connections and controls, making the camera more expense and most likely delaying the launch. 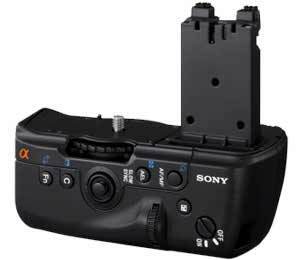 So Sony wisely brought the A100 to market without an accessory battery grip. This hasn’t stopped some aftermarket accessory makers from developing grip fro the A100. We’ve discussed the DeCain and Ownuser accessory grips on these pages in the past. Many photographers have had good experience with the aftermarket units, but since there are no internal contacts to allow a grip to communicate withe the camera, users have to put up with external cables to get the job done While it’s mice to have an aftermarket alternative, it’s obvious that a factory designed grip with internal connections would be a preferable solution.. When the Sony started to design the Alpha A700 dSLR, they started from scratch. Sony went to a lot of effort to make sure the Alpha A700 corrected any weaknesses inherent in the A100. One of the first things they did was add internal connections for a battery grip. The grip, known as the VG-C70AM is due to start shipping this month. The two biggest demands for a vertical grip center around better handling when shooting in a vertical mode and the addition of extra battery power. Sony nailed both of these objectives with the VG-C70AM grip. Vertical grip enhances the Alpha A700’s ability to shoot in the portrait orientation. The new A700 vertical grip looks like someone took an A700, cut the standard grip off and glued it to a battery container. Every control and button that appears on the camera’s built-in grip is mirrored on the accessory grip — in virtually the same location. Anything you can do with the standard grip you can accomplish with the accessory grip as well. Since the A700 automatically rotates the menus on the camera’s big LCD screen, this results in an excellent vertical image making machine. As far as extra power goes, the grip has provision for two NP-FM500H batteries, which Sony claims will produce twice the battery life. (Well, duh!) . You have to remove the camera’s standard battery to attach the grip, so you only have two batteries available — but that is still a major improvement. Two batteries power the removable grip. The question of weight naturally arises. The VG-C70AM weighs in at 10.1 ounces without batteries. Add two NP-FM500H power cells at 2.75 ounces each and the whole works is still slightly under 1 pound. The grip also adds about 3.5 inches (87.2mm) to the height of the A700 — a nice bonus if you have large hands. 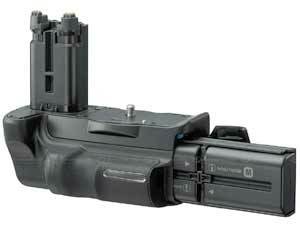 Like he A700 itself, the VG-C70AM battery grip is constructed with an internal Magnesium-Alloy. Sony also says the unit has rubber gaskets to seal out dust and moisture. Now there is good news and bad news. The bad news is that the VG-C70AM cannot be retrofitted to the A100, The A100 and A700 have completely different camera bodies and as we’ve already discussed, there are no internal provisions for a grip on the Alpha 100. So if you were hoping to bolt one of these bad boys to your A100, you’ll have to be content with on of the aftermarket solutions. Ah, but there is a very good chance that the VG-C70AM will be fully compatible with Sony’s next dSLR; the famous Sony Alpha flagship. Based on the mockups shown last March, the A700 and the flagship share a common body. Thus the flagship (which many observers are calling the A900, although Sony hasn’t confirmed the name) will most likely be able to use the VG-C70AM. It makes sense, as it will save tooling and design costs if Sony can create a single grip for both models. Rear side of the grip shows the thoughtful control layout. Of course the standard disclaimers apply. 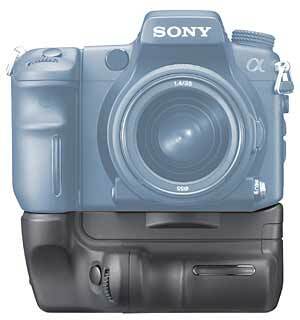 Sony has only revealed a mockup of the flagship, so there is no guarantee that the A700 grip will be compatible. Don’t base your buying decisions on the mockup, as things could very well change. If I was a betting man, however, I would give you pretty good odds that the VG-C70AM will fit the flagship when it appears.. This entry was posted in DSLR, Photography, Sony A700, Sony Alpha, Sony DSLR, Vertical Grip. Bookmark the permalink. Post a comment or leave a trackback: Trackback URL. Wow, nice… that’s a good looking piece of equipment. One of these days I’m going to ditch my KM 7D and pick up a Sony. Many thanks for the info on sony grips. Like you I have been a Minolta user from before the first auto focus (I still have the body and use it). It has never let me down. I nearly went Nikon because Minolta were dragging their feet. Now at last we seem to be getting somewhere and I await their “A900”. A shame it is still not Minolta, but at least I can use equipment. Hopefully, our numbers will grow even though Sony does not have the same ring but I guess we can live with that. It’s all good and well that they’ve decided to make a vertical grip for the a200 and up, but it doesn’t really do anything for my a100 owning self. It’s not as though I can run out and buy every new model they release. I wish there was a trade in program, like with cars. I’m starting to feel like I became a guinea pig test subject when I got the a100. I’m starting to get bitter about how wonderful all the new models are because all anyone can talk about is how they’ve fixed the problems with the a100. i own a sony a100. bought as my first dslr (started on digital not on film) .. its a pretty crummy camera, but i still love it. I have just moved from NIkon to sony and have the A700 soon the A900 too. What i want to know is how good is the battery grip copies and are they a good alternative if you do not want to shell out the expense on a generic one – i would rather spend on glass. “Great vid. Even Greater shop. Shops RULE!!!! (No kitchen workshop to be seen here). Can’t wait to see all your new toys hooked up and in place on the Blazer. Hopefully you will get TONS, TONS, and MORE TONS of valuable data. right, this pictures was probably taken at the Monino museum. It’s missing its wings and engines.